Ginni Rometty returns to the WEF Annual Meeting and engages in the CEO panel discussion addressing “Business Leadership in the Fourth Industrial Revolution,” joined by David Taylor, CEO, Procter & Gamble; Bill McDermott, CEO, SAP; and Hiroaki Nakanishi, Executive Chairman of Hitachi Ltd. Moderated by Roula Khalaf, Deputy Editor, Financial Times. Ginni Rometty returns to the annual Consumer Electronics Show (CES) to deliver the 2019 opening keynote, addressing how pioneering technologies like AI, cloud and blockchain are reshaping industries and our daily lives … and what lies ahead. At the second annual Bloomberg Global Business Forum, Ginni Rometty engages in a conversation with British Prime Minister Theresa May about business and government partnerships, including open economies and free trade as drivers of innovation and growth. Ginni Rometty presents the report on the company. Ginni Rometty delivers the Chairman’s Address at Think 2018 — IBM’s premiere conference featuring AI, cloud and making the world work smarter, and welcomes three special guests to amplify how this era marks an inflection point for business, society and IBM. Ginni Rometty engages in a panel discussion at the WEF Annual Meeting to address the importance of “Data Responsibility in a Fractured World,” with Mario Greco, Zurich Insurance CEO; Steven J. Corwin, NewYork-Presbyterian President; and Sunil Bharti Mittal, Bharti Enterprises Founder and Chairman; hosted by Robert F. Smith, Vista Equity Partners CEO. Ginni Rometty engages in a conversation at Dreamforce 2017 with Marc Benioff, Salesforce CEO, about the future of work. Ginni Rometty keynotes the third annual IBM Security Summit and shares three important lessons from the era of cognitive security. Ginni Rometty headlines the general session of InterConnect 2017 — IBM’s premiere cloud conference, where she discusses why the IBM Cloud is the platform for the next era of business and invites many special guests on stage to bring her message to life. Ginni Rometty delivers the opening keynote at HIMSS17, the world’s leading global industry conference of the Healthcare Information and Management Systems Society, where she addresses the transformative power of cognitive healthcare and makes related IBM announcements. 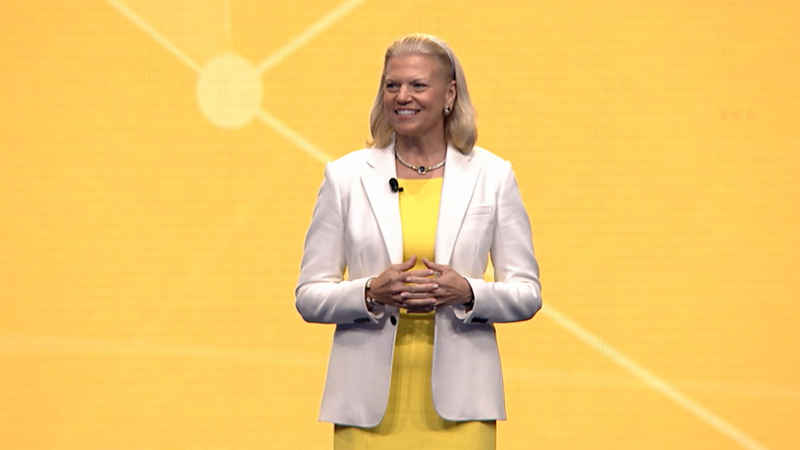 Ginni Rometty delivers a keynote at the Anita Borg Institute's Grace Hopper Celebration of Women in Computing, sharing her perspective on women pioneers in technology, today's cognitive era and three personal lessons learned. Ginni Rometty presents the IBM report on the company. Ginni Rometty delivers a keynote at the World Health Care Congress, sharing the importance of cognitive computing to the future of healthcare and making two related IBM announcements. Ginni Rometty delivers a keynote at CES (Consumer Electronics Show) addressing the importance of cognitive to the Internet of Things. Ginni Rometty provides a comprehensive overview of IBM's strategy in a one-on-one interview with Andrew Ross Sorkin, founder and editor at large of DealBook. Ginni Rometty meets with Gartner and launches IBM's point of view on Cognitive Business. Ginni Rometty discusses new ways of thinking about enterprise security. 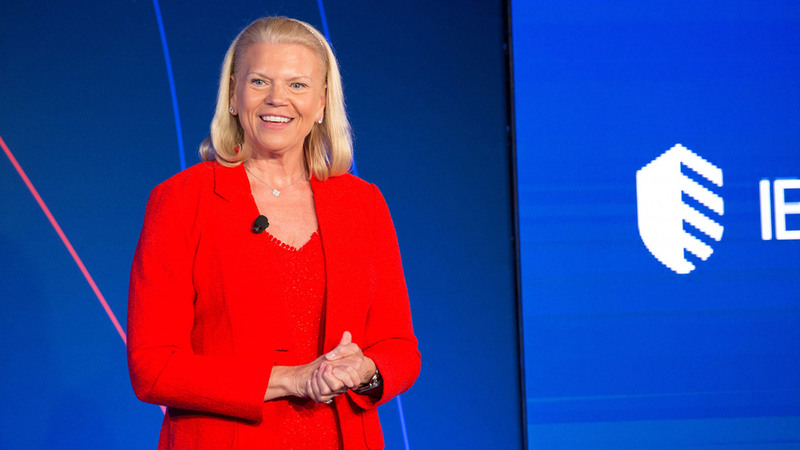 Ginni Rometty discusses how IBM's Watson is redefining the way we work and live. Ginni Rometty discusses how the cognitive computing revolution, led by IBM's Watson, is unlocking the potential of big data to generate insight, optimize clinical time, individualize patient care – and open new pathways to cures. Ginni Rometty describes how three historic technology shifts happening at once – data, cloud and engagement – are reshaping industries, enabling new kinds of value, and creating enormous opportunity. Ginni Rometty is featured in a one-on-one interview about transformation with Michal Lev-Ram, senior writer, Fortune magazine. Ginni Rometty describes the implications for mobility as three historic shifts—data, cloud and engagement—transform both technology and global business. Ginni Rometty describes how Big Data and changing expectations are intersecting with a confluence of major technological shifts—cloud computing, analytics, social and mobile—to fundamentally reshape commerce. Ginni Rometty is featured in a one-on-one interview about research, social, and Watson with Stephanie Mehta, deputy managing editor, Fortune magazine. 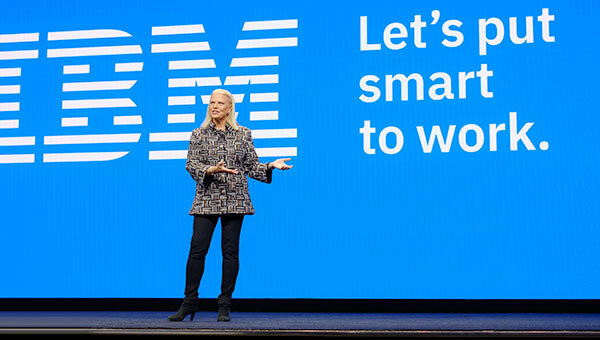 Ginni Rometty discusses the emergence of a new type of organization, one that is smarter, more authentic, more competitive and better able to lead, in remarks at IBM's annual InterConnect meeting. Ginni Rometty discusses the importance of the free flow of data as a driver for innovation and competitive advantage at a meeting of The Lisbon Council. Ginni Rometty lays out the competitive advantages of a smarter planet, followed by a Q&A session with the audience at the Council on Foreign Relations. Ginni Rometty delivers the keynote address to commemorate the 75th anniversary of IBM in Japan. Ginni Rometty is featured in a one-on-one interview with Jessi Hempel, senior writer, Fortune magazine.